If you live in a place with a high water table or which is subject to frequent heavy rains or snow melt in the springtime, you should probably familiarize yourself with the concept of the sump pump. The sump pump occupies a recess in the basement floor and typically comes on automatically when it detects rising water, sucking up that water and pumping it out of the basement before it becomes an issue. Sump pumps are easy to install and can make the difference between a house that’s livable (and saleable should you wish) and one that is not. 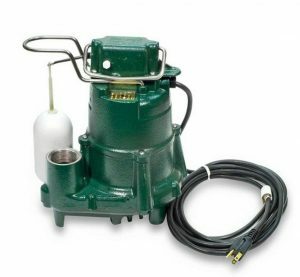 Below are the 5 best sump pumps on the market today. Wayne makes some of the best known and dependable sump pumps around and has been a market leader in sump pump technology for years. This 3/4 HP sump pump is available in either cast iron or stainless steel and pumps a remarkable 4,600 gallons of water per hour. It fits comfortably into an 11 inch or larger diameter sump and the corrosion resistant stainless steel doesn’t wilt from the job when the groundwater swells or the rains pound down. With a 1.5 inch NPT discharge and a robust cast iron base that stays put through thick and thin it’s your 24-hour a day bulwark against the scourge of basement flooding. 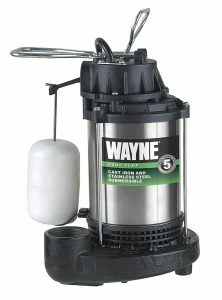 The Wayne 3/4 HP Submersible sump pump doesn’t require any fancy or expensive installation work, nor will you be waking up to find it’s failed you when you need it most. The reinforced polycarbonate impeller and float guard ensure the viability of the mechanism and the top suction design minimizes the potential for clogging. The 8 foot power cord should be plenty long to reach a power source without having to resort to an extension cord. And just to put a cherry on the sump pump cake, it’s also assembled in the USA (although some parts are manufactured overseas). 8 foot water-resistant power cord. Fully submersible, made of corrosion-resistant stainless steel. Top suction action minimizes the chance of clogging. Flow rate of 4,600 gallons per hour. 3,500 gallons per hour discharge at 10 ft of lift. Fits into 11 inch diameter or larger sump pit. Will provide years of trouble free service. Not the quietest sump pump on the market. 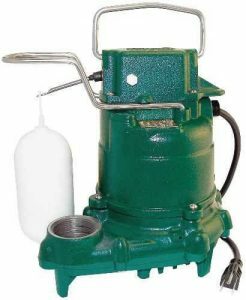 Zoeller is another experienced manufacturer of pumps for all occasions, including high-quality sump pumps like the M53. The M53 features a smaller motor than the Wayne we just profiled but it is still strong enough to move 2,600 gallons of water per hour. Which will be enough for all but the most extreme conditions. Essentially, if you have an occasional problem with water in the basement during heavy weather incidents this will likely be all the sump pump you need. The pump itself features the aforementioned 1/3 HP motor, is fully submersible and has a durable and dependable plastic vortex impeller. There’s a tough cast iron housing with powder coated epoxy fasteners and a clog resistant vortex impeller design. The float triggers the pump when water levels reach approx 4” in the sump basin and the tough, rust-resistant switch won’t let you down. Oil free operation means low maintenance reliability and the 120 volt motor isn’t going to give you any compatibility problems. 1/3 HP, 120 volt oil free motor. Will pass solids up to 2 inches in diameter. Single piece cast iron body. Durable construction from a reliable well-known manufacturer. Removes up to 2,680 gallons of groundwater per hour. Fully automatic operation and low maintenance. Float switch is known to be pretty sensitive. If you’re tired of damp boxes, musty odors and mold clinging to the walls you need a dependable pump that’s going to keep things clear. The Superior Pump 91250 is a light duty sump pump that’s just right for most homes with less than serious basement flooding issues. It features a 1/4 HP split capacitor motor, will evacuate up to 1,800 gallons per hour and can pump that water up to 25 vertical feet to ensure it’s well up and out of your basement. This isn’t the sump pump you’re going to want if you live on the bayou but for most small to mid-sized homes in damp areas it should be just what the doctor ordered. 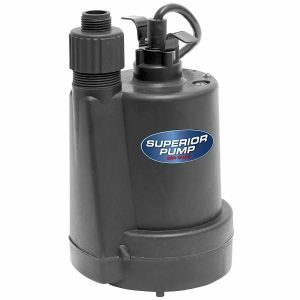 The pump is lightweight and compact, fitting comfortably into a 6 inch diameter sump basin. The thermoplastic construction ensures it’s not going to deteriorate into a pool of rust and makes it the ideal solution for homes, farms and small businesses. Should you find yourself in a situation where you need to move a lot of water in a hurry it has a 1 1/4 inch diameter discharge tube. A float switch can be added if you wish with minimal fuss and the whole thing is virtually maintenance free and backed by a 1 year limited manufacturer’s warranty on parts and workmanship. Capable of pumping up to 30 gallons per minute. 1/4 HP split capacity, continuous duty motor. Capable of pumping water 25 vertical feet. 1/4 HP, 120 volt motor. Moves up to 1,800 gph. For everyday or sump pump use. 1/4 HP engine is typically enough for most homes. The corrosion-proof construction is a big plus. Maximum pumping volume of 1,800 gallons per hour. Some of the seals are of questionable quality. The Liberty Pumps 257 is another lightweight, compact sump pump with a fixed vertical float of 7 inches and an extra-long power cord that allows you additional leeway when situating the pump. Unlike many larger pumps you can fit the 257 into a sump basin that’s a mere 10 inches in diameter. There’s a 1.5 inch NPT discharge that can carry water up to 21 vertical feet, an 18 inch shut-off head and the 1/3 HP motor can move an impressive 3,000 gallons of water per hour; much more than pumps with 1/4 HP engines. This is an ideal sump pump for small to medium sized homes or commercial buildings with light to moderate water issues in the basement. The 257 can easily handle 1/2 inch solids and the oil-free, thermally protected motor is designed to use up to 40 percent less electricity than most other comparable sump pump motors. The pump features a one piece cast iron housing that is fully immiscible and will stand the test of time. 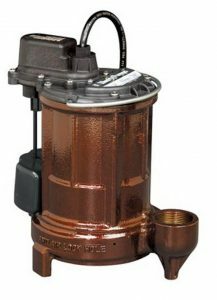 The ability of the 257 to move such a high volume of water and to do so while still using significantly less energy than other comparably sized motors means it is definitely one of the good sump pump values on the market today. That rare combination of performance and efficiency is something we’d like to see in more such devices. Simply put, for moderate basement water issues the 257 is perhaps the best sump pump you can buy. Extra-long 10 foot power cord. Easy to set up, easy to use, easy to maintain. Fits into 11 inch diameter sump basins. VMF switch is magnetically operated. Single piece cast iron construction. Pumps up to 3,000 gph. Max vertical discharge of 21 feet. High-quality durable construction for years of reliable service. 10 foot power cord provides added versatility during installation. Falls a bit short of its 21 foot discharge claim. When Zoeller says their M98 is a cast iron sump pump they aren’t kidding. The main housing is made of a single piece of 25-30 class cast iron with a tensile strength of 25,000 lbs, as are the base and switch case. The vortex style impeller is made of engineered plastic which is both durable and corrosion-proof. And the cast iron components have a powder-coated epoxy finish. The M98 power cord is a longer than necessary 15 feet in length that really allows you to pick and choose where you install it. The intake is designed to resist clogs even while it deftly handles solids of up to 1/2 inch in diameter. With a 1/2 HP motor the M98 is hungrier than most other home sump pumps and that is evidenced by its ability to evacuate up to 72 gallons per minute or 4,320 gallons per hour. That means that in about 6 days it can fill an Olympic sized swimming pool. If you have more water than that in your basement you’re going to need an ark not a sump pump. From the 2-pole switch to the oil-fed cast iron bearings to the ceramic shaft seal to the auto reset thermal overload protection this is a sump pump after the heart of those who have been struggling to keep their basement dry. Moves 72 gallons of water per minute. Will pump water up 23 vertical feet. Best in class 15 foot power cable. Easily passes solids up to 1/2 inch in diameter. High density 25-30, 25,000 lb. cast iron. Oil-filled split capacitor motor will stand up to years of punishment. Moves up to 4,320 gallons of water per hour. Features automatic thermal overload protection. Heavier than many other pumps. There are two main types of sump pumps in use today, the pedestal and the submersible. This type of pump sits on a platform or pedestal over the sump basin with a tube running down into the sump to vacuum up water. While this type of pump is typically easier to service (since you don’t have to reach down into the basin to detach and remove the pump as you do with a submersible) there is plenty of debate about whether or not this feature is really such a big deal. Still, some people – mostly building maintenance engineers understandably looking for ways to lighten their workload – are fond of the pedestal sump pump, not just for their easy accessibility but because they tend to last for many years, since they are removed from the corrosive effects of being submerged in the sump basin all the time. The major drawback of this type of sump pump is that it is less energy efficient than a pump that sits right in water while it’s pumping, and it costs more to install. A submersible pump spends a lot of its time under water at the bottom of the sump basin. This means it has to be built of tougher stuff than a pedestal pump. But it also means it’s more energy efficient because it isn’t wasting energy sucking water up from a couple of feet below before moving it out via the discharge pipe. The submersible pump is by far the most popular type of sump pump for homeowners. Because, while it might take a few more minutes to retrieve it from the sump basin for servicing, such servicing episodes are few and far between and the pump tends to be more reliable on a daily basis than pedestal pumps. Which is important if you’re trying to keep your one-and-only house from becoming a victim of hydrostatic pressure and playing host to bacteria, mold, mildew, fungus and you name it. The horsepower of the motor on your sump pump will determine how much water it’s going to be capable of moving. Weaker motor, less water moved. Stronger motor, more water moved. For most small and medium sized homes a 1/4 horsepower motor will typically suffice. If your water problems are serious you’re likely going to want 1/2 horsepower or more. The head pressure is defined as the height that the pump is able to raise water effectively from the sump basin to the discharge point. Many pumps are capable of raising water 20 vertical feet or more, a few as much as 30 feet. Chances are you won’t have to raise water that far to get it to the discharge pipe. Few are the homeowners who want to be bothered venturing down into the basement every time it rains to turn on the sump pump. Even if they have it wired into a switch in the kitchen there’s still a chance they’ll forget to flip the switch and wind up with a flooded basement. So, automatic is the smart choice. You should never plug your pump into an extension cord but instead directly into a ground fault circuit interrupter (or GFCI) outlet. This will help ensure the system doesn’t short out and leave you with the dreaded basement full of water. Sump pump motors for American homes are typically 120 volts. Different voltages are available for some pumps but those are almost all pumps intended for commercial purposes. Some people want to know when the pump is triggered and set up an alarm system to alert them. At the same time it’s always recommended that you have some type of backup system in place on the off chance that your sump pump fails. Since they don’t spend much of their useful life under water pedestal pumps will last a good 25 to 30 years in most cases. Submersible pumps however, will typically last only about half as long. Still they’re more energy efficient and many homeowners appreciate the fact that being in the sump basin means the submersible pump is typically quieter than the pedestal pump. The sump basin or pit is where you will create access to groundwater that’s lurking beneath your basement. You can rent an electric jackhammer at the local home center and do it yourself. While you’re there make sure you pick up the basin to set inside the hole. To determine the proper diameter of the sump basin place your pump upside down on the floor and draw a circle about 4 inches larger than the pump housing. Make sure your basin is at least 10 inches in from the foundation walls so that the hammering won’t undermine their integrity. Once the concrete slab has been broken in the shape of the circle remove the loose concrete and dig the basin/hole to the required depth. That typically means you want the top of the basin wall to be flush with the surface of the concrete. Once the hole is dug place the basin in the hole then fill in around it with gravel up to 1 inch from the top. Fill the rest in with concrete until it’s flush with the floor. Smooth it off and let it sit for 24 hours. Set your sump pump in the basin according to the manufacturer’s instructions. You may be directed to add a bit of gravel at the bottom of the pit or to set the pump on a concrete paver or something equivalent to keep the pump above the bottom of the pit. Then again, you may not. Do whichever the instructions that come with the pump tell you to do. Then install the check valve. Connect a short piece of PVC to the end of the check valve. Then add an elbow to the open end of that piece. Make sure the open end of the elbow is pointing in the direction you want the discharge pipe to go. Add as many pieces, including elbows, as necessary to get the pipe up to the above-ground portion of the foundation wall. Then drill a hole through the foundation and run the pipe out. Once outside continue the pipe to the drainage point, which should be far enough away from the house to prevent water returning to the basement. With the discharge pipe completed plug in the pump (make sure you use a GFCI-protected outlet NOT an extension cord), fill the basin with water and see if the pump works. It should automatically engage and start pumping the water out. When the water level drops to a certain point the float should signal the pump to turn itself off. Which type of pump is better: Pedestal or Submersible? They’re both good but most homeowners prefer the submersible type because they’re typically more economical and faster to install since there is no need for any above grade construction to accommodate the pedestal pump. Submersible pumps are typically quieter too. How much horsepower will I need? That will depend on how much water you anticipate having to move. The greater the volume the more horsepower to move it. If you only have occasional problems with water during extreme weather events then the best sump pump for you would probably be one with a 1/4 horsepower motor. Should my pump be cast iron, stainless steel or something else? Whether cast iron, stainless or even thermoplastic your pump is designed to last for a good long time. So which material you choose will be largely a matter of personal preference. Cast iron will stand up to anything. But do you really anticipate problems in the sump basin that would require that kind of strength? Can I direct my washing machine discharge to the sump pit? Your sump pump is designed to handle groundwater, not soapy discharge filled with softening agents, bleach and other chemicals. Also, lint frequently finds its way into the washing machine effluence and that can jam up your sump pump. We’d recommend against using the sump for the purpose of removing washing machine waste water. What happens if water freezes in the discharge pipe? If frozen water blocks the discharge pipe the pump is going to continue to run without sucking up any water. Eventually the pump will overheat and shut down, if it has a thermal overload protector. If this happens unplug the pump and let it cool completely. See if you can remove the ice in the line without breaking the PVC and then restart the pump. The sump pump can turn a damp, moldy basement that’s essentially useless whenever it rains hard into a dry, useable part of the house which you can turn into a home office, in-law apartment or home entertainment center. Your entire house will be a healthier place for everyone and it will also enjoy a significant boost in bottom line market value. Should such things interest you, use the above info and tips to make sure you get the best sump pump for your home and reintegrate your formerly useless basement with the rest of the house today.